The reference point for discussing expected impacts is based on a functioning healthy ecosystem. Each of the rangeland cover types has a list of individual indicators that can be evaluated and analyzed to help determine livestock grazing impacts. The indicators represent a broad set of economic, ecologic and social values. As time and resources allow additional indicators and rangeland cover types will be added to the website. To review a list of indictors available for a rangeland cover type select the cover type and press "GO". The predicted impact for each indicator is evaluated with information presented in a similar format. The indicator is briefly described and defined. The significance of the indicator is provided. Indicators with designations as Threatened, Endangered or state listed are noted as appropriate. Some indicators are referenced to similar indicators included in either the Interpreting Indicators of Rangeland Health (TR 1734-6) or the Sustainable Rangelands Roundtable (SRR) indicator lists. How the indicator is expected to respond to various grazing practices is presented in a narrative form and with visual grazing impact graphics. The expected changes presented are not absolutes and typically depend on a variety of factors including weather, past grazing history, fire and other major impacts. The predicted changes for each indicator are useful when evaluating how likely established goals can be met with various grazing practices. 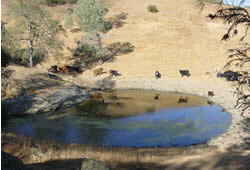 A livestock grazing plan typically includes four important variables, grazing intensity, grazing season-of-use, livestock class/type and frequency of use. The first three components are evaluated for each indicator. The fourth component, frequency of use, is not well studied with inadequate information available to predict impacts based on the rest interval between use periods. A good guideline for frequency of use is to allow adequate rest for vegetation to recover between use periods. Five levels of grazing intensity are evaluated for each indicator. Grazing intensities can vary from non-use to extreme use that degrades the environment. Evaluating the impacts of grazing intensities that are between the extremes can be difficult because of other variable influences such as weather, rainfall amounts and timing. The definitions for the five intensity classes evaluated for each rangeland cover type is provided at the beginning of the indicator list for that rangeland cover type. Six season-of-use grazing practices are evaluated. The timing of forage use periods can have significant impacts on livestock productivity and subsequent plant species composition. There are obviously many ways to classify season-of- use. The definitions for the six season-of-use practices evaluated for each rangeland cover type is provided at the beginning of the indicator list for that rangeland cover type. Each indicator evaluation includes two grazing impact graphs that visually display the expected impacts for different grazing strategies. One graph is provided for impacts related to class of livestock. The other graph provides a prediction of impacts related to grazing strategies that are a combination of season-of-use and grazing intensity. Impacts are rated from High Positive to High Negative plus unknown. A combination of colors and arrows are utilized to indicate the degree of impact. Green with large up white arrow is high positive and red with large down black arrow is high negative. Other colors and intermediate arrow sizes are used for intermediate impact levels of moderate and low. Techniques describing how the Indicator can be measured and monitored are provided. Relevant references are provided that support the discussion and predictions for the indicator. This website is a dynamic site that is intended to be updated and improved when better information becomes available. For most indicators there is a contact person who is familiar with the indicator. You can email this person if you know of more recent published information regarding the indicator or have a need for clarification of information that is included on the website.